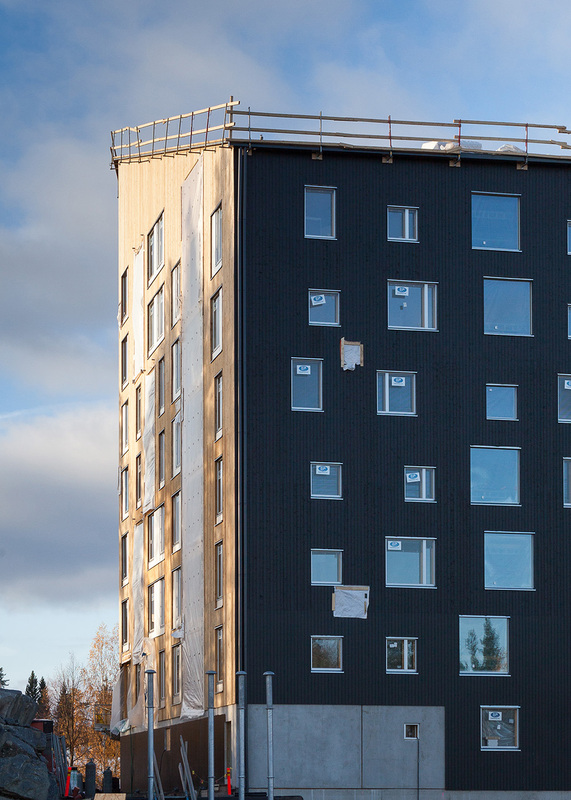 In the Jyväskylä suburb of Kuokkala, the first part of the Puukuokka Housing Block is nearing completion. 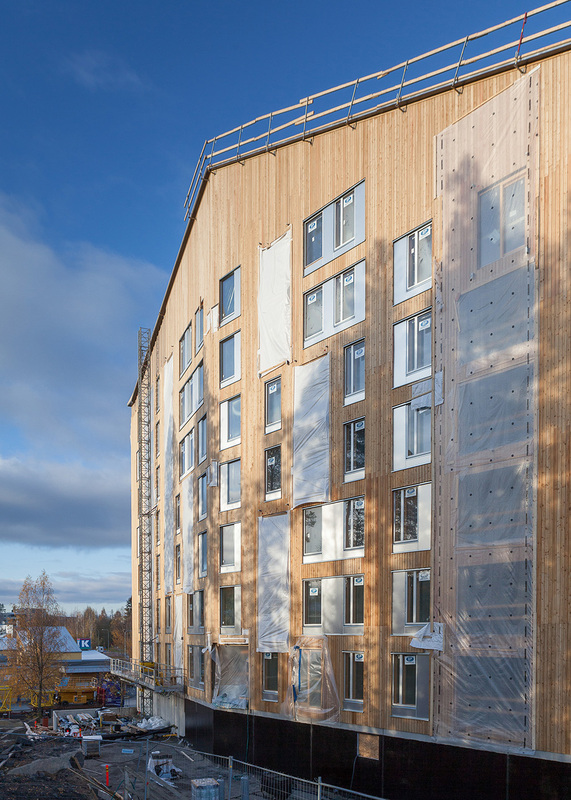 Puukuokka 1, the first part of a complex to be composed of three wooden multi-story apartment buildings, is expected to be completed by the end of November 2014. 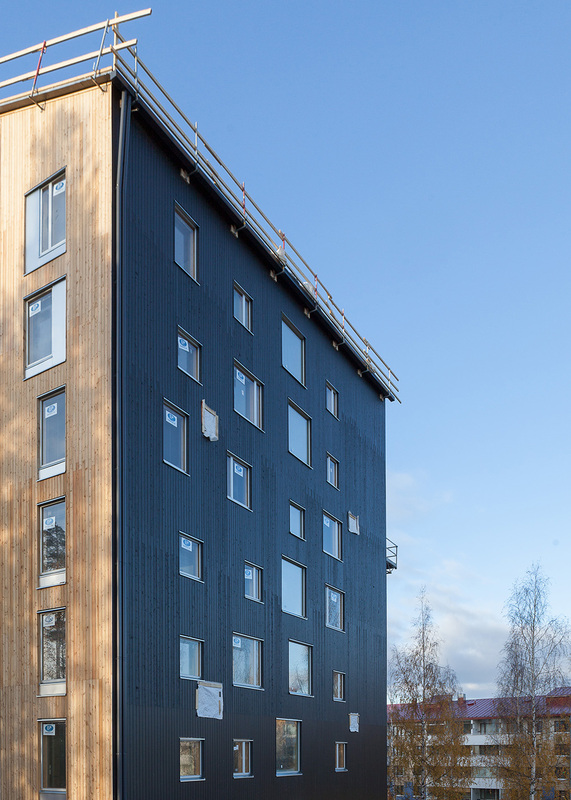 It will be the first wooden apartment building of the height of 8 stories in Finland. 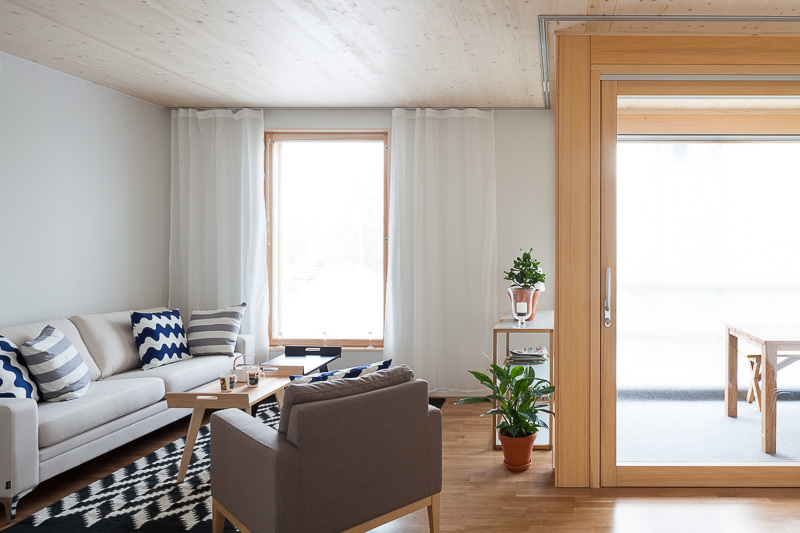 The CLT (cross laminated timber) structure is designed in collaboration with Stora Enso, with the new urban MultiStorey® concept, consisting in prefabricated modular cubical elements. The box-like CLT elements work as load-bearing and stiffening structures offering good dimensional stability. With the use of the cubical elements, fewer joints are needed and less additional handling is required than in ordinary timber buildings. 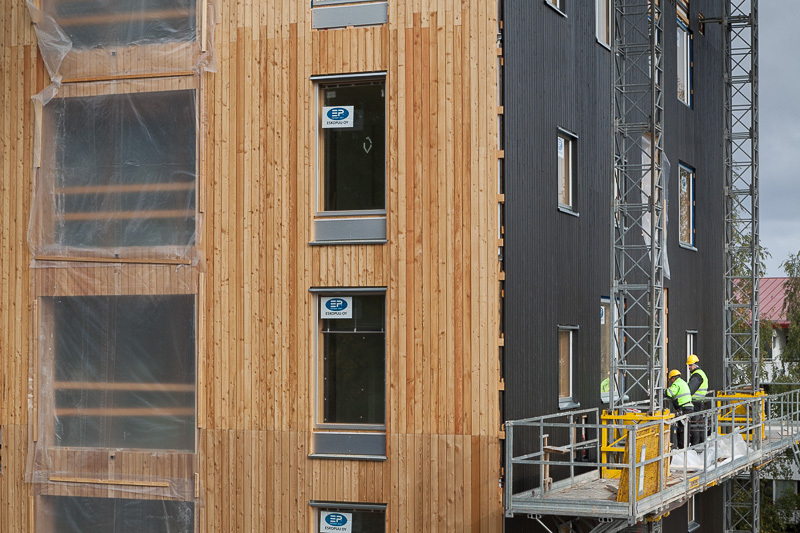 After assemblage, wooden facade cladding is added and balconies are mounted. The other two buildings in the complex will also soon start taking shape and will complete the Puukuokka Housing Block in 2015. The multi-story wooden apartment block is of particular interest as a sustainable housing solution thanks to its reduced environmental impact and increased eco-efficiency. It is carefully integrated into to the surrounding townscape, thanks to attentive planning in collaboration with the Jyväskylä City Planning Department. It also pioneers an innovative financing model which offers a low-cost and low-risk funding alternative for homebuyers. There is strong interest in the Puukuokka Housing Block. 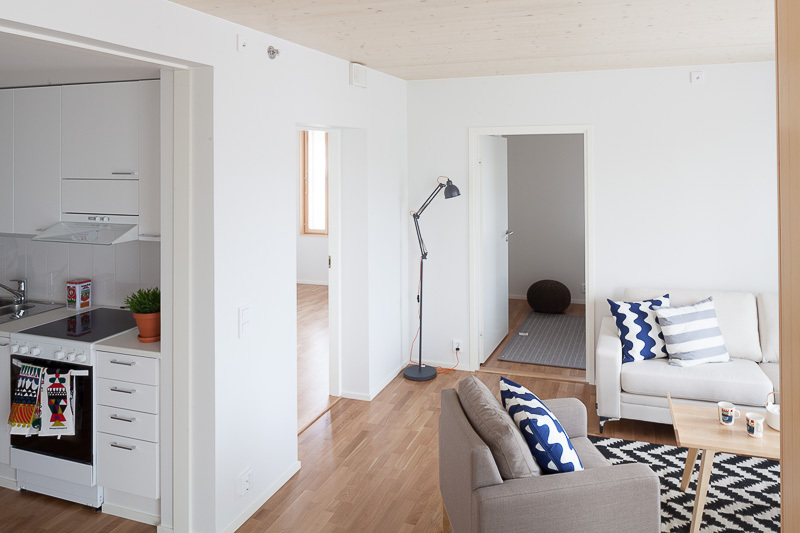 The project was highlighted at the Forum HolzBau / Nordic Wood, the Nordic Wood Building Conference that took place in late September in Trondheim (Norway). It is also presented at the Suomi Seven exhibition in Frankfurt, Germany at the Deutches Architekturmuseum (until January 18, 2015 ) and featured in the Annual Rings 1994-2014, New Generation of Wood Architecture exhibition at the Museum of Finnish Architecture in Helsinki (until January 25, 2015). We are happy to share with you some images of the project in its final stages of construction. You can also see some of the first images of the interiors here.